After really enjoying our Australia Day feast of Gain Yang I decided to buy a chicken and have a go at cooking it at home. As always when I am faced with a new Thai dish that I need to know more about I turned to David Thompson. He is absolutely my favourite Thai chef and I doubt that I would be as interested in Thai cooking if it were not for his wonderful cookbooks. If you don't have them, do yourself a favour and go out and buy them as soon as possible. Even if you are like me and spend more time just reading them than cooking from them they are still worth buying. 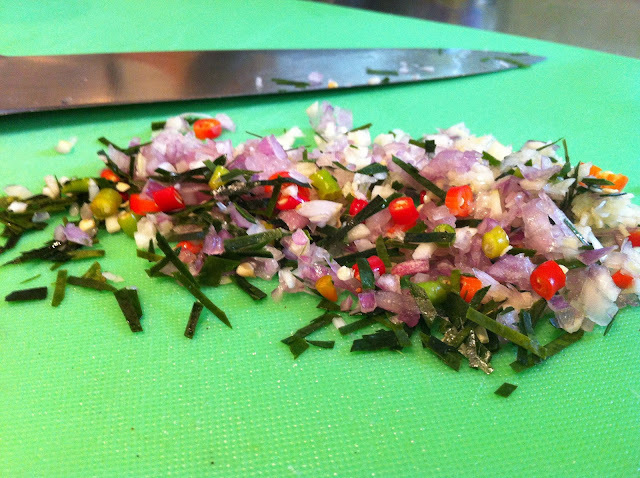 pund the coriander, salt, garlic and peppercorns into a fine paste using a mortar and pestle then add the palm sugar and fish sauce. I put the flattened chicken into a large ziplock bag and add the paste and squish it all around then leave it in the fridge for a few hours. 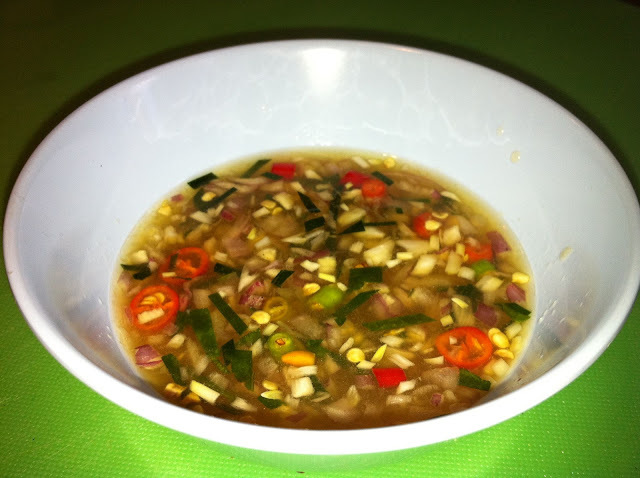 Combine all the ingredients and have a taste, mmm delicious. I sometimes add a bit of palm sugar to sweeten it up a bit but that's just my personal choice. No meal of Gai Yang would be complete without sticky rice. Not many people cook sticky rice but once you realise how easy it is you'll be cooking it all the time. It does take a bit of pre preparation as you need to soak the glutinous rice overnight (or start it in the morning at the latest). Measurements don't matter much for this, just soak a few cups and you should be fine. I love having sticky rice soaking because if you don't use it for savoury purposes there are many many wonderful Thai sticky rice desserts that you can make too. My method for cooking sticky rice is to steam it in my awesome multi layered steamer. 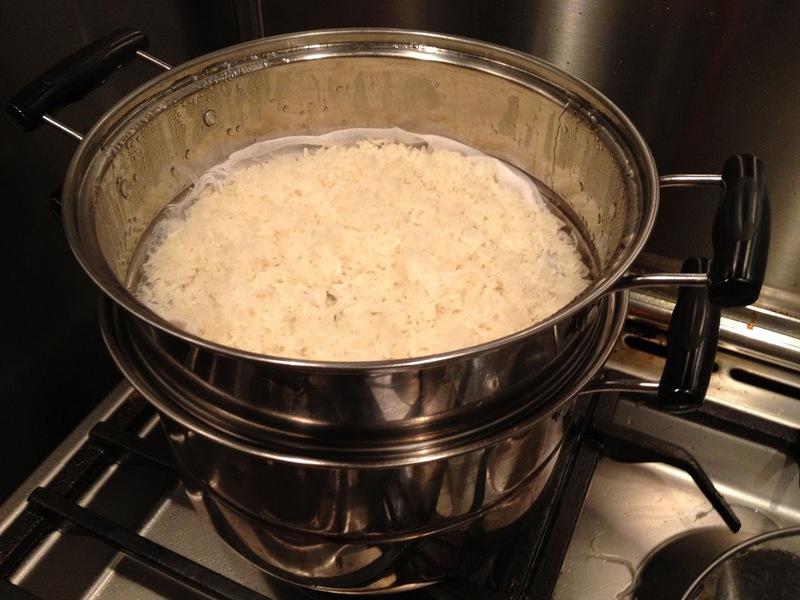 I just strain the rice then place a muslin cloth in the steamer and add the rice then put the lid on. I steam it for 20 minutes over fast boiling water and give it a bit of a turn after 10 minutes. Make sure you try it before turning off the heat just to make sure the grains are nice and yielding. If they aren't then you may not have soaked it for long enough or might need to steam it for longer. I have cooked sticky rice this way quite a few times and never had a problem so I highly recommend it. 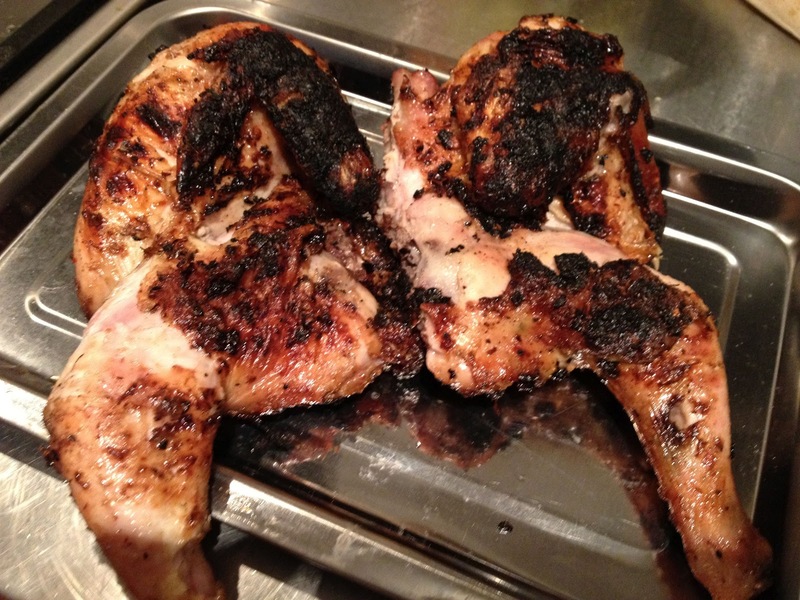 Grilling the chicken is also pretty simple, make sure your coals are at the right heat. I prefer to use charcoal but heat beads will work too, you just won't get that wonderful flavour that charcoal give you. When it comes to cooking chicken I don't really have a specific timing, try and get it cooked all the way through without getting it too charred. At this point of the night I had had a few red wines so I wasn't paying as much attention as I would normally have but my guests were happy with the result so that's the main thing. To text that the chicken is done I make a small cut in the thigh joint and have a peek to check there is no blood, I also like to see that the liquid that oozes out from the cut is clear with no trace of blood. Fortunately for my guests my photography skills decline under the influence much faster than my cooking skills! I reckon this is definitely a hands only meal, I just love pulling off pieces of the chicken or rolling little balls of sticky rice and dunking into the delicious dipping sauce.